New iOS 11 update coming soon! 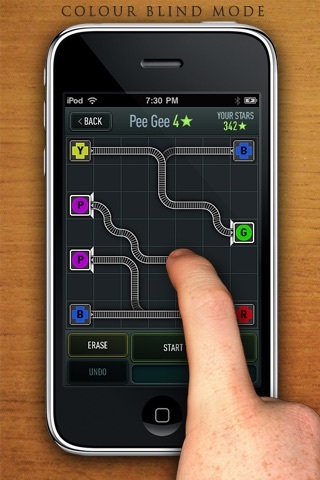 :) "The best puzzle game on the App Store." 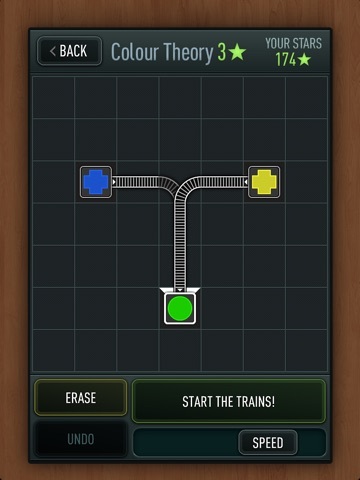 What's the difference between Trainyard and Express? 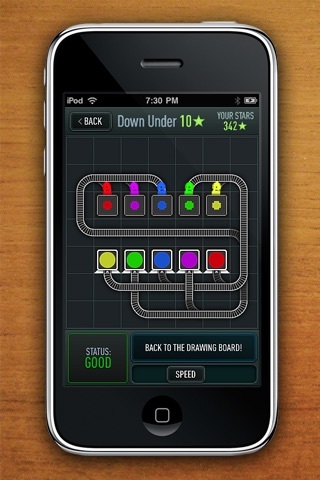 In the full game there are more than 100 more puzzles, and you can even MAKE YOUR OWN PUZZLES. The full game also has splitter pieces, which are AWESOME. 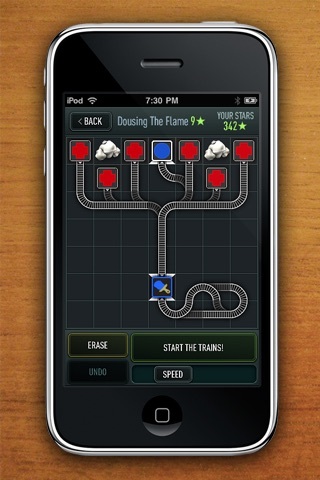 Trainyard Express Features: + Innovative and challenging puzzle mechanic + Smooth difficulty curve + Over 60 fantastic puzzles + NO ADS + Hundreds of ways to solve each puzzle + Easily share your unique solutions on Trainyard.ca + Looks GREAT on the iPad + Game Center + Engineered for low battery usage + Colour-blind mode + A year in the making + Developed in my spare time(support indie games!) 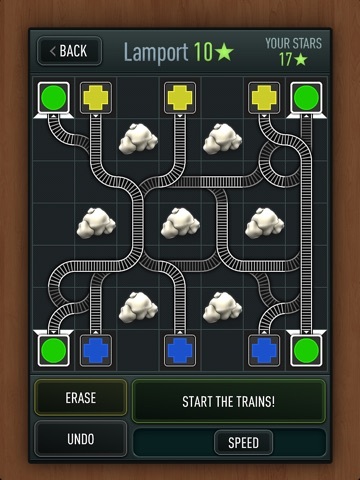 Stuck on a puzzle? 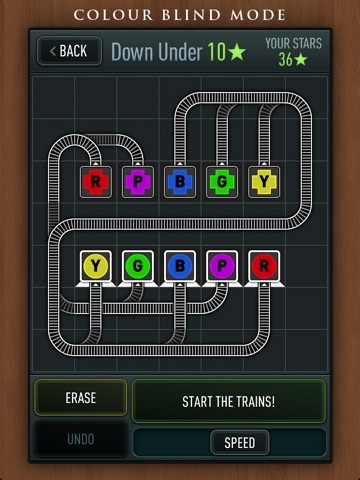 There are over 1.2 MILLION player submitted solutions at http://trainyard.ca/solutions Trainyard Express is a puzzle solving game unlike any that you've ever played. It's easy to learn but very tough to master. 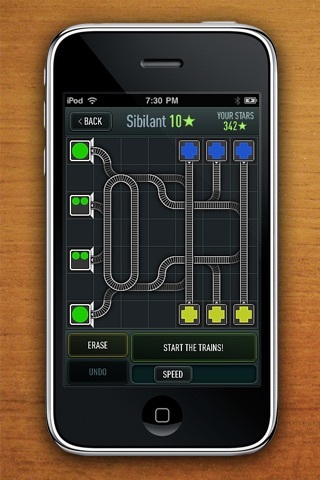 Your job is simple: get each train to a goal station. Red trains go to red stations, blue trains go to blue stations, etc. 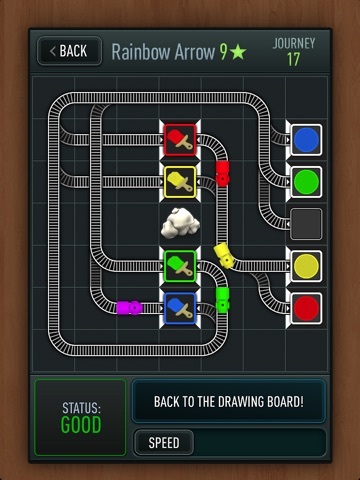 You control the trains by drawing track for them to follow. There isn't a time limit or even a score; the only thing you need to do is figure out a solution for each puzzle. 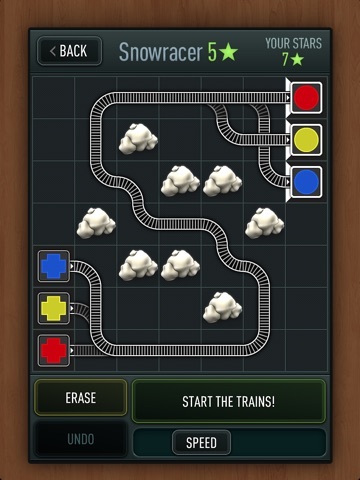 The first few puzzles are almost too easy, but as the difficulty increases you'll be thankful that you were able to practice the fundamentals of drawing track. 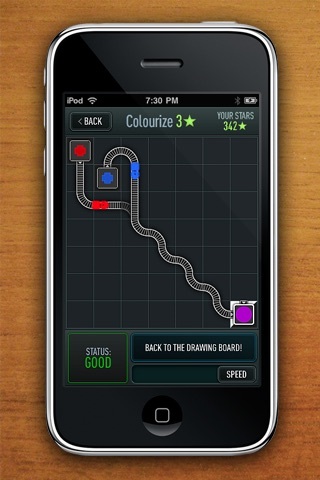 As the game progresses, you'll have to use basic colour theory to combine trains of different colours, use timing to merge, and use every inch of your brain in your quest to beat the game. Find out more at http://www.trainyard.ca Developed by Matt Rix (matt@trainyard.ca) Proudly made in Canada. Known issues (minor): - If some provinces can't be unlocked even after you've solved all the available puzzles, that's a bug: Go to options, switch to player 2 then back to player 1 to fix it. - Sometimes, the sounds stop working. Close the app using the multitasking bar to get sounds back. Trainyard Express makes use of these excellent libraries: + Cocos2D-iPhone by Ricardo Quesada + XAuthTwitterEngine by Aral Balkan + Twitter+OAuth code by Ben Gottlieb + MGTwitterEngine by Matt Gemmell + ASIHTTPRequest by All-Seeing Interactive + SFHFKeychainUtils by Buzz Andersen + TouchXML by Jonathan Wight + FMDB by Flying Meat Inc.